Who Wants to be a Millionaire 2011 is the universal representation of the syndicated game show from Beeline Interactive Inc. This app is available for the iPhone, iPod Touch, and iPad, and if you’re a fan of trivia or game shows, this app is a lot of fun. Let’s get one thing cleared up right away, this is Millionaire 2011. In other words, if you’re not familiar with the new rules presented in this season’s syndicated version of Who Wants to be a Millionaire, you’ll be a little bit lost playing this game. Not that the variation is any reason to shy away from this game, just know that it mirrors the changes seen on this season of the popular game show. To sum things up quickly: gone are the days of progressively difficult questions. 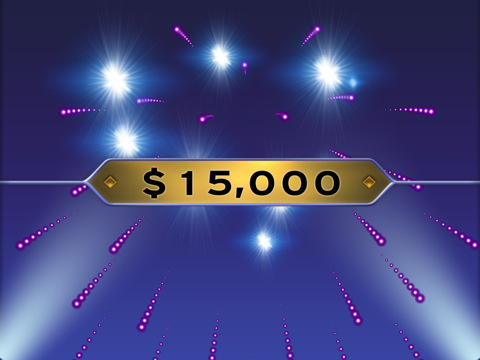 Instead, Millionaire 2011 (and this season’s TV show) have mixed up the first 10 questions and the first 10 dollar amounts — a seemingly difficult question might only be worth $1,000 while a seemingly simple question might end up being worth $25,000. However, this comes with a catch: if you choose to “walk away” during the first ten questions, only receive half of the money you have banked away to that point. If you get through the first ten questions, you have a maximum possible bank of $68,600. From here, the final four questions are like the “old” format, with an increasing difficulty leading up to the $1,000,000 question. The lifelines are different in this format are different from the original as well, as the current version of Millionaire offers contestants one “Ask the Audience” lifeline, in which the studio audience is polled, and two “Jump the Question” lifelines, with which the contestant can literally jump to the next question, though they forgo receiving the money associated with that question. All in all, I feel like the the new rules offer a fun variation on a game show format that had become tired and stale. Millionaire 2011 captures that new format in a simple and fun fashion. While Millionaire 2011 captured the new rules and lifelines of this season’s Millionaire TV show, the presentation of the game leaves a lot to be desired. Instead of being presented with a feeling of being in the studio and being a contestant on the TV show, Millionaire 2011’s visuals just resemble what a contestant might see on the monitor in front of them on the show. And while the sound effects and music present in the game are very authentic to the show, Meredith Vieira’s voice is noticeable absent, as is any crowd noise. That being said, Millionaire 2011 is extremely simple to play, and the multiple choice questions lend themselves to a touch-screen interface. Millionaire 2011 isn’t about fluff or flashy presentation, but rather an authentic Millionaire experience, and a fun trivia game. 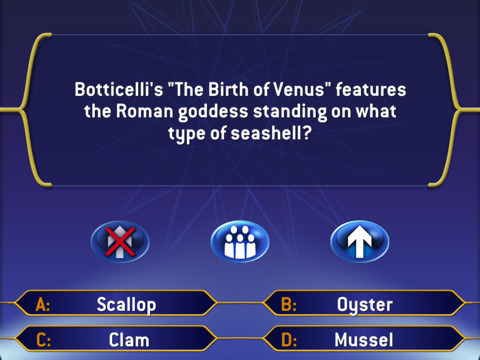 At around 1,000 questions, this game won’t keep you occupied forever, but for 99 cents through the holiday weekend, this is one app any trivia or game show lover shouldn’t ignore. AppSafari review of Who Wants To Be A Millionaire 2011 was written by Alex Seiver on July 3rd, 2011 and categorized under App Store, Board, Games, Puzzler, Word Games. Page viewed 5903 times, 1 so far today. Need help on using these apps? Please read the Help Page.